1. Arrange chicken pieces in a single layer in a lightly greased 13- x 9-inch baking dish. Pour dressing evenly over chicken pieces, and sprinkle with ground pepper. 2. Bake, uncovered, at 400° for 1 hour or until done, basting every 15 minutes. Sprinkle baked chicken with desired toppings. Note: For testing purposes only, we used Good Seasons Sun Dried Tomato Vinaigrette With Roasted Red Pepper dressing. 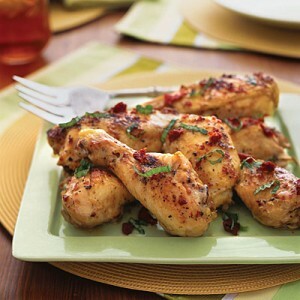 Sun-dried Tomato Chicken Breasts: Substitute 6 skinned and boned chicken breasts for chicken pieces. Prepare recipe as directed, decreasing bake time to 30 minutes.